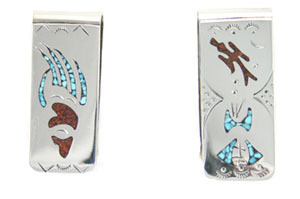 This nickle silver money clip has a layer of sterling silver with abstract designs of chip inlay. It measures approximately 2" long and 3/4" wide. Native handcrafted by Navajo artist Joleen Yazzie. None available with paw or waterbird as pictured. All are different abstract native designs.